Director John Ford worked with Western icon John Wayne (whom he made a star with 1939's Stagecoach) on more than twenty films, and Jimmy Stewart on just three. All three joined forces only once for The Man Who Shot Liberty Valance (1962), one of the last films in Ford's prolific career and one of his most accessible and enduring efforts. Stewart stars as Ransom "Rance" Stoddard, a US Senator visiting his old stomping grounds of Shinbone to pay respects to the late Tom Doniphon (John Wayne). Not much is explained about their relationship, or the effect it had on Stoddard's wife Hallie (Vera Miles), his friend Pompey (Woody Strode), or the morose Link Appleyard (Andy Devine). But they're all made up to look older, so it's pretty obvious that a lengthy flashback is just around the corner. Sure enough, the bulk of The Man Who Shot Liberty Valance is spent 30 years in the past. We learn how Stoddard arrives in Shinbone after a brutal robbery by local gunslinger Liberty Valance (Lee Marvin, playing one of the most horrific villains in Western history), how he set up shop as a budding attorney-at-law, meeting tough-guy rancher Doniphon, and more. As far as "fish out of water" tales go, it's good enough: Stoddard's sense of justice is represented perfectly by the charismatic Stewart, and his relationship with Doniphon feels believable when their first signs of friction slowly transition into mutual respect. The inevitable showdown with Valance is supplemented by a love triangle between Hallie and our two leads, as well as Stoddard's changing attitude towards firearms; to the film's credit, its leisurely pacing ensures that neither feels rushed. Those "present day" bookends threaten to steal some of the thunder, but Ford's steady direction makes the end product feel organic instead of gimmicky. Still, portions of The Man Who Shot Liberty Valance feel a little doughy, from the bumbling exploits of ineffective Marshal Appleyard to the rambling rants of perpetually sauced Shinbone Star editor Dutton Peabody (Edmond O'Brien), neither of which contribute much more than comedy relief or plot advancement. And as for the entire side-story of Stoddard teaching half of Shinbone to read, the jury's still out: surely there are more economical ways to put him over as a "capital H Hero", and most of them wouldn't feel as condescending. 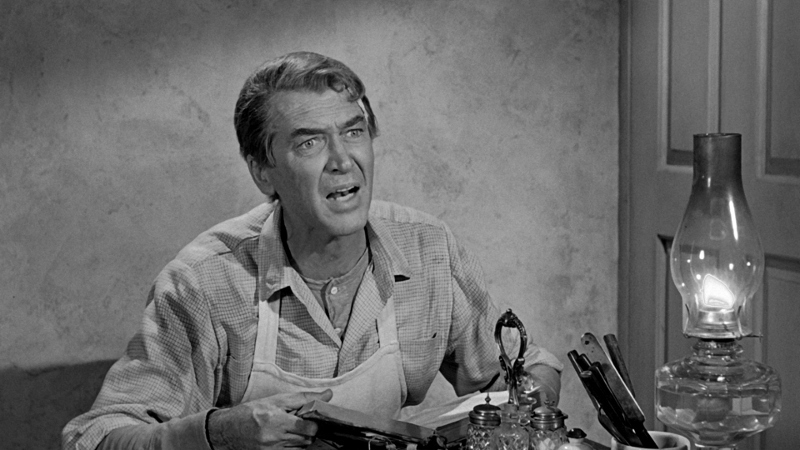 Luckily, The Man Who Shot Liberty Valance more than survives this handful of less impressive moments: our leads and most of the supporting performers have presence and charisma to spare, and its thoughtful core story has aged much better than most films of the era. Just don't take a drink every time John Wayne says "Pilgrim", or you won't make it past the 60-minute mark. 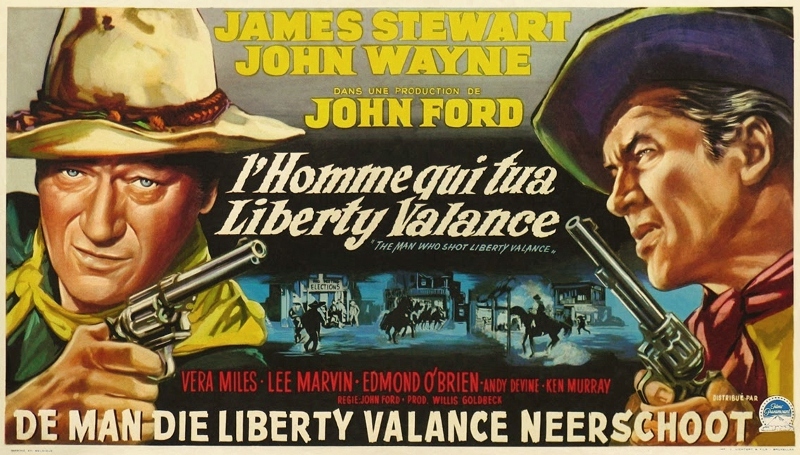 Released twice on DVD by Paramount (first in 2001, then in 2009 as a Centennial Collection disc), The Man Who Shot Liberty Valance feels like a logical candidate for high-def royal treatment. Warner Bros.' Blu-ray falls a little short; the A/V presentation is terrific, but this is obviously the same barebones region-free disc released overseas more than three years ago (and most likely authored even earlier). Don't get me wrong: Ford's film stands up just fine on its own two feet, but Warner's recent war against bonus features is more than a little disheartening. 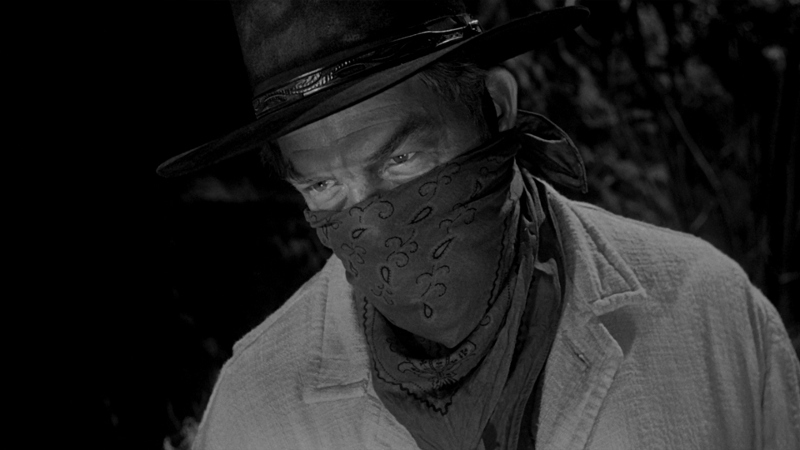 Presented in a slightly opened up 1.78:1 aspect ratio (not its original 1.85:1 format), The Man Who Shot Liberty Valance looks fantastic on Blu-ray. This is a fantastic 1080p, 1.78:1 presentation that easily outpaces the respectable Centennial Collection DVD in every department. Textures are stronger, image detail more noticeable. Dirt and debris have been carefully removed. Contrast and black levels are more stable and digital imperfections (excessive DNR, edge enhancement, etc.) are nowhere to be found. 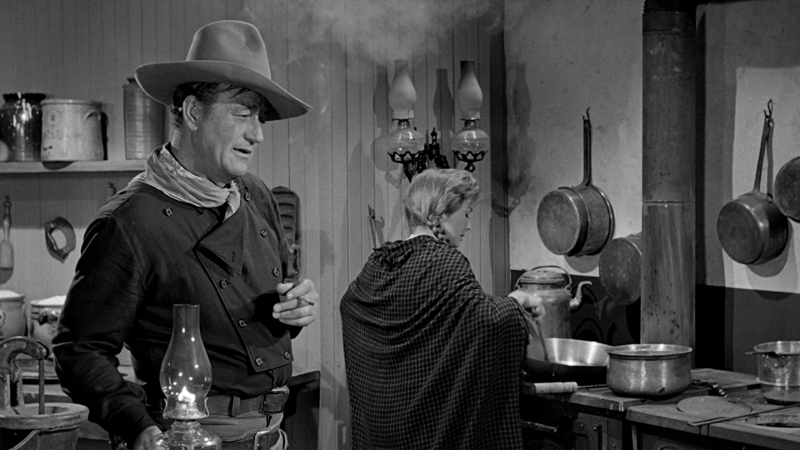 Lighting and atmosphere are such a major part of Liberty Valance that this improved image yields a more satisfying and effective experience overall; in short, nothing of importance is lost in the shadows. Die-hard fans and newcomers alike should be thrilled with this new visual presentation. Not surprisingly, the default DTS-HD Master Audio track (presented as a tasteful 5.1 remix, along with a restored Dolby Digital track that preserves its one-channel roots) replicates the source material quite well. Dialogue is clean and crisp, background details are balanced nicely and the score rarely fights for attention. The only potential drawbacks, such as a thin high end and limited dynamic range, are undoubtedly due to the original elements. Anyone familiar with lower-budget films from this era should know what they're getting and, in that respect, The Man Who Shot Liberty Valance won't disappoint. Lossy French, German, Italian, and Spanish dubs are included, as well as optional English, SDH, French, Spanish, German, Danish, Dutch, Finnish, Italian, Norwegian, and Swedish subtitles. Though predictably low on style points, Warner Bros.' standard menu interface is clean, easy to navigate and loads quickly. This region-free Blu-ray is packaged in a standard keepcase with much grittier cover artwork than previous editions. No inserts or slipcovers are included. Sadly, the excellent bonus features from the Centennial Collection DVD (two audio commentaries, a retrospective documentary, photo galleries, and the trailer) have not been ported over to this Blu-ray, which is extremely lazy on Warner's part. It seems that a number of current and upcoming Paramount catalog titles share the same fate, so let's hope this disappointing trend doesn't last for long. The Man Who Shot Liberty Valance isn't John Ford's best film, but it's highly entertaining with solid replay value...and even if you're just approaching it as a fan of James Stewart and/or John Wayne, you'll walk away happy. Even with its slightly bloated plot and a few hammy performances, there's no shortage of drama, mystery, and even a few laughs along the way. If nothing else, it's worth catching up on the original while Paramount's remake is still in development. Sadly, this Blu-ray is just another in a long line of Warner/Paramount discs that have been robbed of the special features from earlier DVD editions, though the stellar new A/V presentation more than makes up for any shortcomings. Either way, both should probably end up on your shelf at some point. Firmly Recommended.